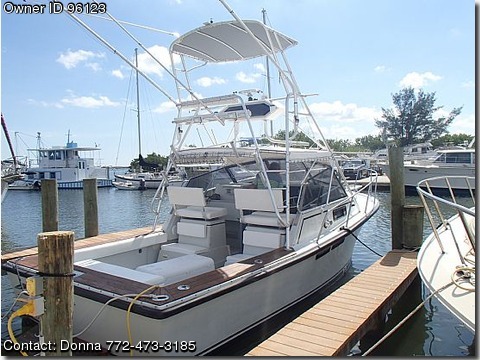 Please contact the owner Donna @ 772-473-3185 with any questions. 1986 Rampage 28 Sportsman Renovated to 2013 This is an exceptionally clean 28 Rampage. Powered by 2 2013 350/300 HP Chevy engines, that have been professionally installed. Full enclosure, large cockpit area. The cabin is also in great shape. For the price offered there is not a better deal on the market. New wiring console and electronics include GPS, fish finder, VHF AM/FM with ipod. This is one awesome fishing machine includes a half-tower w/buggy top, full helm controls. Her generous cabin accomodates 3 nicely with a fully equipped galley and full stand up head. Two burner stove with AC/DC refrigerator. Full sized enclosed head with shower. H/C Pressure Water System AC/DC Fridge.